Cats Protection have received a generous donation of over £3,000 from online gift company Wordynumnum, working in partnership with comedian Bob Mortimer. 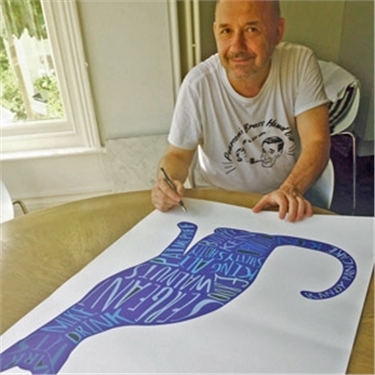 The donation, totalling £3,211, is from the sales of a series of limited edition art prints emblazoned with imaginary ‘cat names.’ Inspired, personalised and signed by Bob Mortimer, the gifts were sold between July and December last year. Bob says: "I initially started jokingly ‘selling’ suggested cat names on Twitter and then began working with Wordynumnum to produce a series of signed prints featuring the names I’d made up, but in the shape of cats." The prints proved particularly popular with fans, often selling out within minutes of going on sale. In addition, a unique A1 cat print was donated to Cats Protection, selling for £412 in an online auction at the end of last year. This bought the overall amount raised to a fantastic £3,623, helping thousands of cats in the charity’s’ care. Bob explained: "I’m a big cat lover and have always had them in my life so it’s great to be supporting Cats Protection, which does so much to help unwanted moggies."